In the brief time I’ve spent watching the short films of Animated Express, my focus has been geared towards the light-hearted, movies like Sleeping Betty and Invasion of the Space Lobsters, which relied on humor to get their points across. Ryan, a 2004 animated documentary conceived and directed by Chris Landreth, took me in an unexpected, and altogether wonderful, new direction. In the late ‘60s and early ‘70s, animator Ryan Larkin was on top of the world. Two of his shorts had been nominated for Academy Awards, and he was a rising star at the Canadian National Film Board. Then drugs and alcohol entered the picture, and three decades later, Larkin was destitute, begging for money on the streets of Montreal. Ryan is a 14-minute animated short based on an interview director Chris Landreth conducted with Larkin (the audio recording of said interview makes up a large part of the movie’s dialogue), discussing his past work, the people he used to know (who also pop up from time to time), and the reasons why his career fell apart. To describe the visuals on display in Ryan is no easy task. Even now, as I sit here searching for a word that will amply define the look of the film, the one that continually pops into my head is “beautiful”, though, in reality, it is anything but that. In truth, the animation technique Landreth employs throughout Ryan can only be described as jarring. Larkin himself is depicted as a twisted, deformed man with portions of his face and body obliterated, symbolizing the effects of the harsh life he’s led. Even director Landreth, while slightly more “together” than his main subject, is presented as having a mutation or two (at the outset, he explains the causes of his abnormalities, in effect relating the traumas that have influenced his art). 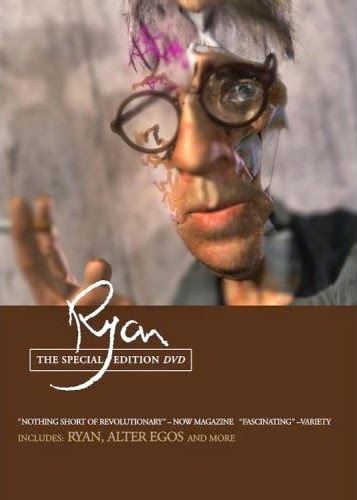 The fact of the matter is, every individual who’s given shape in Ryan is somehow incomplete, which in itself says quite a bit about the human condition. At times, Ryan is an uncomfortable film (during the course of their conversation, Landreth confronts Larkin about his alcoholism, leading to a rather tense exchange between the two), yet I highly recommend the experience. It is a movie that wallows in the darkness, and from that darkness shines a light of creativity brighter than any I’ve seen in some time. Not only do I recommend you watch Ryan, but I believe you should do so more than once. There is so much going on in this movie that it’ll take multiple viewings to explore its various nuances. In fact, as soon as I log off here, I’m going to watch it again.